The medium speed 4 stroke trunk piston engine can be found on most medium to large merchant vessels even if the main engine is either a steam turbine or a 2 stroke crosshead engine. In these cases it will often be found that the electrical power is supplied by alternators driven by medium speed 4 stroke engines. They are the favoured method of propulsion on ships where head room is a minimum, for instance, on ferries and passenger vessels, and where, as is the current trend for these ships, diesel electric propulsion is utilised. Diesel electric propulsion allows the engines to be placed wherever is most suitable, as they no longer have to be aligned with reduction gearing and shafting as is the case with conventional installations. Generally, medium speed engines run at between 250 - 850 RPM. Above this range they are defined as high speed engines. Although not as powerful as their 2 stroke crosshead cousins, the largest 4 stroke engines are delivering just over 2000kW per cylinder. Advances in design and materials have led to an increase in efficiency, together with an increase in turbocharger pressure ratios which allow a greater quantity of fuel to be burnt per cycle. Medium speed engines have a higher power to weight ratio than the slow speed two strokes, but due to the higher speeds tend to have reduced maintenance intervals. The largest of these engines have a bore of 640mm and a stroke of 900mm (Wartsila 64), although engines which are nearly "square" are more the norm: For example, the Sulzer ZA40 has a bore of 400mm and a stroke of 560mm or the MAN-B&W 58/64 which has a bore of 580mm and a stroke of 640mm. A square engine is one where the bore is equal to the stroke. The name "Trunk Piston" refers to the piston skirt or trunk. The purpose of the skirt or trunk in four-stroke cycle engines is to act in a similar manner to a crosshead. It takes the thrust caused by connecting-rod angularity and transmits it to the side of the cylinder liner, in the same way as the crosshead slipper transmits the thrust to the crosshead guide. 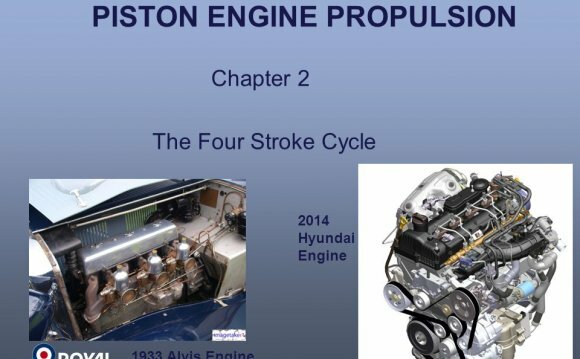 With such engines, which are termed trunk-piston engines, the engine height is considerably reduced compared with that of a crosshead engine of similar power and speed. The engine-manufacturing costs are also reduced. It means of course that there is no separation between the crankcase and the liner and piston. This has its disadvantages, especially when considering the choice of lubricating oils when burning high sulphur residual fuels.